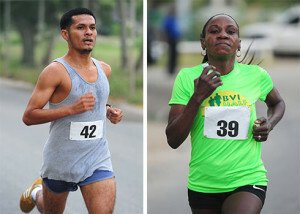 MARCH 10—After just over a year away, Ruben Stoby returned to the territory then showed his fitness level by winning Saturday’s Dive BVI 5K Series race on Virgin Gorda, becoming the third winner in as many races—this time by smashing the course record. Stoby navigated the loop in the Valley in 18 minutes and 41 seconds to finish ahead of Julius Farley—who won the last race—and followed in 19:40. Virgin Gorda resident Curwin Andrews was third in 20:00. The race, which attracted 65 participants, raised $600 for St. Mary’s School, whose students assisted with registration, water stops, cheering and started the race. Final Results. Men: 1. Ruben Stoby, 18 minutes and 41 seconds. 2. Julian Farley, 19:40. 3. Curwin Andrews, 20:00. 4. Ravindra Sukhu, 20:08. 5. Zebulon McLean, 20:40. 6. Emrol Amsterdam, 20:46. 7. Keith Williams, 21:23. 8. Kevin Jackson, 22:23. 9. Rainford Legair, 23:07. 10. Jermain Abram,s 25:06. 11. Matt Crossman, 25:55. 12. Craig Ruetzel, 25:58. 13. Brian Hespriah, 26:14. 14. Dan Hewison, 27:07. 15. Wilbert Samuel, 30:21. 16. Scott Butz, 30:25. 17. Lewis Munn, 31:10. 18. Stephen Beard, 31:49. 19. Noah Fox, 35:26. 20. Zoltan Birinyi, 35:59. 21. Indi Abrams, 36:41. 22. Bob Gause, 38:22. 23. Atlas VanSickle, 39:24. 24. Doug Daren, 44:24. 25. Murry Maxwell, 44:24. 26. Lars Giersing, 46:09. 27. Ron Callan, 46:53. Women:1. Rosmond Johnson, 22:27. 2. Lara Burt, 26:48. 3. Lissa Eidelman, 27:07. 4. Lindsey Wilson, 28:27. 5. Barbara Rhodes, 29:23. 6. Aman Bispham 29:23. 7. Lisa Redfern, 29:34. 8. Leanne Munn, 29:35. 9. Arielle Goodley, 29:38. 10. Ghislaine Hoojendijk, 29:40. 11. Becca Knight, 29:58. 12. Roslyn Gilbert, 30:15. 13. AJ Syrett, 31:13. 14. Clair Burke, 32:11. 15. Tara Murphy, 32:22.16. Sally-Ann Riley, 35:27. 17. Kia Edwards, 35:29. 18. Mary Dann, 37:28. 19. Chris Yates, 39:07. 20. Sarah VanName, 39:30. 21. Beth Besom, 39:30. 22. Judy Gause, 40:26. 23. Debbie Ridgeway, 45:39. 24. Kya Ridgeway, 45:39. 25. Linda Giersing, 46:09. 26. Penny Callan, 46:58. 27. Kim Beradine, 47:29. 28. Tieneke Louw, 47:29. 29. Betty Biancardi, 48:33. 30. Lynn Hawkins, 48:33, 31. Linda Li, 49:31, 32. Sophie Bennett, 49:31, 33. Arlyn Gordon, 1:00:19, 34. Aiko VanSickle, 1:00:19. 35. Eva Fox, 1:02:15. 36. Amy Riddlestorffer, 1:02:16. 37. Michela Paradisi, 1:02:16. 38. DNF Milli Abrams.